Phew!!! As I write this the weather is, let’s face it, ‘HOT!’. That said, I suspect by the time this goes live our brief spell of summer may have gone, but certainly the last few days has got me recalling how tough it is as a new mummy tucking baby up for bed, when you are so scared of baby overheating and the weather outside is so hot! Even if this lovely weather subsides, many of you may now be planning holidays and wondering/worrying already how baby will sleep. In fact 18degrees is considered a comfortable temperature for baby’s room. So how do you keep baby comfortable, when the weather is so warm outside …..? Generally your baby only needs only one more layer than you. Childalert.co.uk (2013) agrees, stating “you should always consider the amount of clothes you are wearing and dress baby accordingly” …. So if you feel too hot at night, and are removing clothing, use this as a gauge to the amount of clothing baby has on. A baby vest or even just a nappy may well be enough. Choose lighter sheets, or bedding appropriate for summer time use. 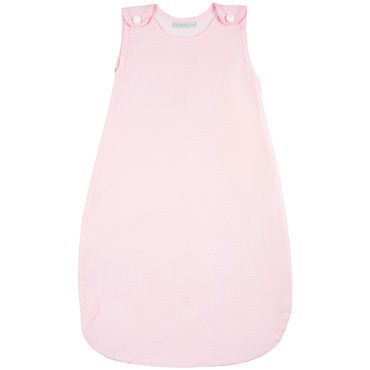 JoJo Maman Bébé stock a range of sleeping bags under 1 tog (like the one pictured below), although in this weather you may find even that is too much. A sheet or large muslin may work better. If it is possible and safe to ensure the room remains ventilated, do so and use a room thermometer to help you judge the temperature. You may find black out blinds help to cool a room and also help baby understand night time (when it is still so light and bright outside). There are even temporary ones you can take on holiday. Swaddling is one of the age old calming techniques (watch out for a blog on the pros, cons and possible techniques soon) – often passed down by grandmas to their granddaughters! Designed to help baby control those first early jerky limbs and to pacify their startle reflex, whilst giving them the snug feeling of the womb, it really can be a useful tool for parents. But in hot weather, a swaddle may be too much. Tiger in the Tree pose – Great for helping cut stimulation and also avoiding stimulating baby’s startle reflex (which tends to happen when baby is laid onto their back). How to do it: Support baby over your arm, cupping their head in your hand (this gives them a feeling of containment similar to that experienced in the womb). You can feel slightly more secure by placing your free hand onto baby’s back to gentle rub or pat! This can be really useful for babies with Colic too, as the pressure on the tummy is so soothing but caution if your baby has reflux. Rocking – Harness the power of rhythm …. Not only will motion remind your baby of the womb (it is in fact one of the five S’s Dr Karp advocates in his book Happiest Baby on the Block, for soothing ….. in this case it represents ‘sway’), but will also help to regulate their own internal rhythm and systems. Try rocking to a pace of 60 beats per minute! 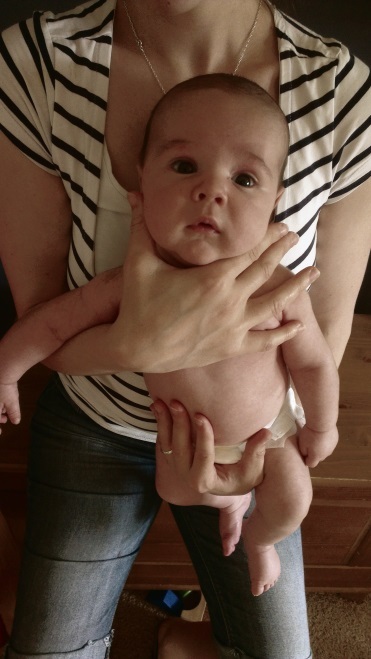 The Daisy Magic Hold – Whilst this is an upright position (so not automatically associated with rest), it is really good for helping baby settle and switch off, especially if you turn them away from stimulation. 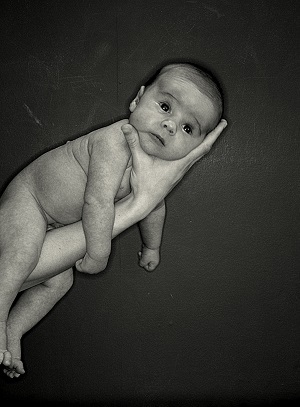 Babies are programmed to look at faces, so when in a more traditional cuddle hold, want to focus on you so intently ….. Even when their body and mind are crying out for them to switch off for a while. Instant calming after hot car journeys! Try gently raising up onto your tip toes and back down again, as you hold baby, to give them motion which is good for both soothing and bringing up wind. We hope this blog post will start to give you some inspiration for settling baby when the weather is so sticky and hot! ← The Annual JoJo Summer Party!